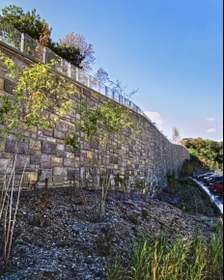 Smith-Midland Corporation The Washington Building Congress has awarded Smith-Midland the 2016 Precast Concrete Craftsmanship Award for its manufacturing of the Smithsonian's National Zoological Park Retaining Wall in Washington, DC. The Washington Building Congress has awarded Smith-Midland the 2016 Precast Concrete Craftsmanship Award for its manufacturing of the Smithsonian’s National Zoological Park Retaining Wall in Washington, DC. The 850 foot long x 30 foot high simulated stone retaining wall was built to replace existing structures along an extensive drop off on the entrance road above parking lot C. General Contractor Hensel Phelps worked with Smith-Midland to design the precast concrete panels, and to complete the welding and wall erection. Originally designed to be cast in place, Hensel Phelps rethought the process, proposing a value engineering option involving the use of a shotcrete wall and placement of precast concrete panels as a facing. The precast panels were engineered like puzzle pieces, creating interlocking sections to disguise the horizontal joints between the panels, blending naturally with the stone block design. This ultimately led to a higher quality final product for the customer. The panels were formed and hand-stained to mimic the look and color variations of a natural stone wall, matching the stone walls located on the nearby Rock Creek Parkway. "This wall has all the color variations of a natural wall, with a permanent penetrating stain that will last indefinitely," says Smith-Midland's president, Ashley Smith. "We are proud of this project. It exemplifies Smith-Midland's ability to innovate. We worked out the logistics with the contracting team, and delivered a quality product for our customer."